Here’s a treat for all you punx who wants to hear old classics instead of new records. Enjoy a song you know too well and share your sexual fantasies and memories of the tanned and attractive O.C. boys in the comments. Is there anything else I have to write here? I’ve used the word punx, mentioned cute boys and encouraged you to write down your sexual fantasies… Nah, I think that’s all that has to be included in a post. This entry was posted in 1980, 1990. Bookmark the permalink. There was this guy in Southern Germany who had the impossible to find original pressing of this of which about a dozen copies exist. He accidentally set his room on fire ind the mid 80s and lost his complete record collection and much more. A few years after this tragic event, he became a famous record producer. I have never seen this record before. I hit every record store in search of punk records from 1979-1985, at least 5 days a week…and I have never seen or heard of this record. I am thinking it is new??? If not…send it my way. I promise I will take care of it. Where did you get it??? Erich, you’re thinking of Lee Perry, and it was his studio, not his room. And in Jamaica, not in Germany. I used to mix those up as well. Jamaica, not Germany and Lee Perry not Armin – all right! Jay: The pictured 7″ is the 90s re-issue. 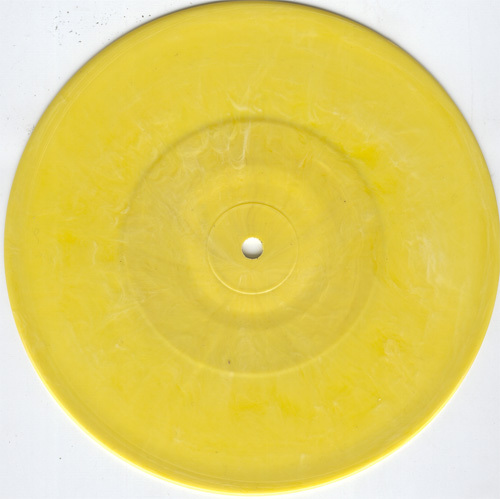 The original press had no p/s and was on golden wax. Oops, sorry, I forgot to put it in the 1980 AND 1990 category. I was a bit unsure of the year and forgot to check it when I posted it. All corrected now thou. Jay, Poshboy did a few of these 1 sided 7inches with popular bands in the early 90s and they’re quite easy to find. There’s one by Circle Jerks and one by Agent Orange that I’ve seen, but there might be more that I haven’t seen. 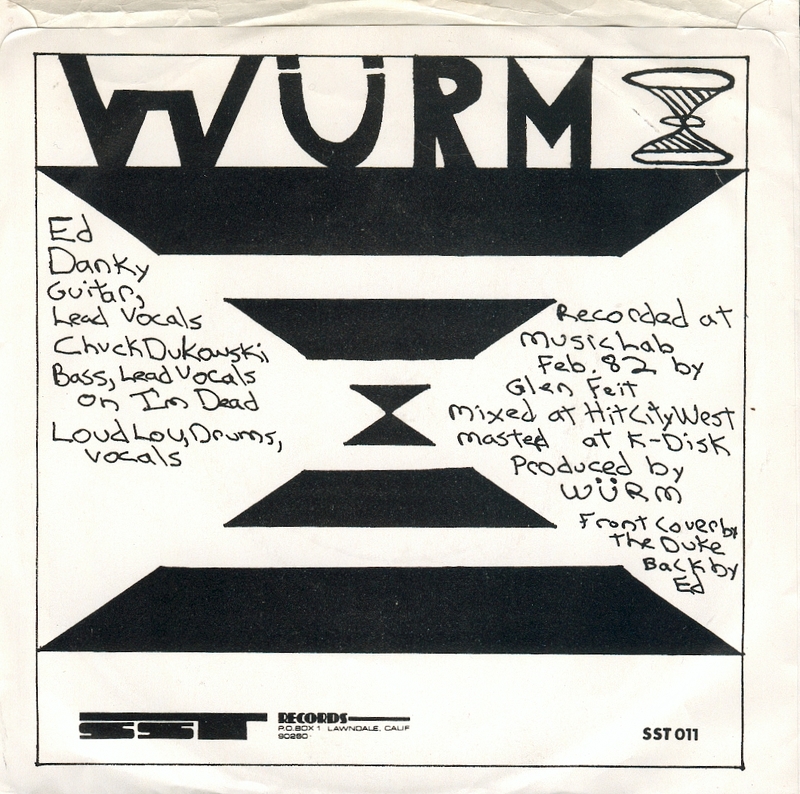 And as Erich wrote, the first pressing of this is a test press in a few copies and of course rare as hell. Yes there are. I have this one and Rik L. Rik “Teenage Destiny” which was crap as far as I remember. Haven’t heard it since I bought it and gave it one shot. Guess I’ll give it a shot again. I want a copy of the original test press…any one have a copy I can have??? How come when someone mentions Posh Boy, I think of the Angry Samoans??? Hahahahahaha…. was this EP released before the LP or after? every site says something different. how much is this thing worth? the poshboy version not the test pressing? There NEVER was a test pressing on gold wax … NEVER !!! There were a dozen or so gold “award” records given out in early 1981 … Tony Brandenburg threw his out into the audience at the Starwood in a fit of pique. All that was manufactured were the pink coloured Posh Boy labels which were stuck onto some Mexican pressings, the “Gold” records. 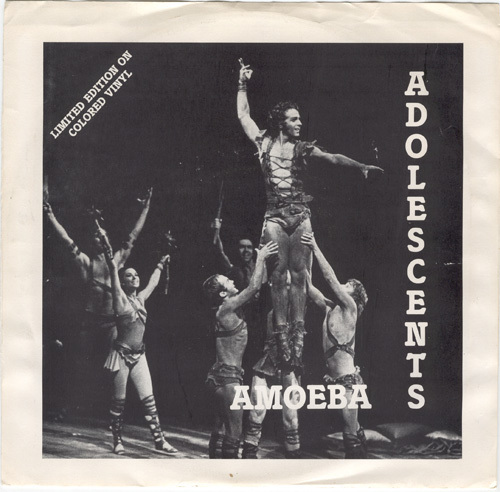 The first time a single version of “Amoeba” was cut was in 1990 for that series of re-issues. Apparently my old nemesis Lisa Fancher bought one of these gold awards off eBay. Mine hangs in my library in Ladismith, South Africa after hanging for the previous 10 years in Phuket, Thailand. 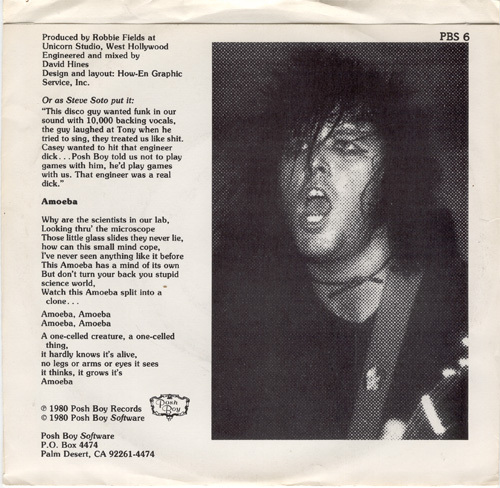 The recording was released on the first Rodney On The Roq album before the “Blue” album was recorded. The 7″ pressing was released only much later in 1990.